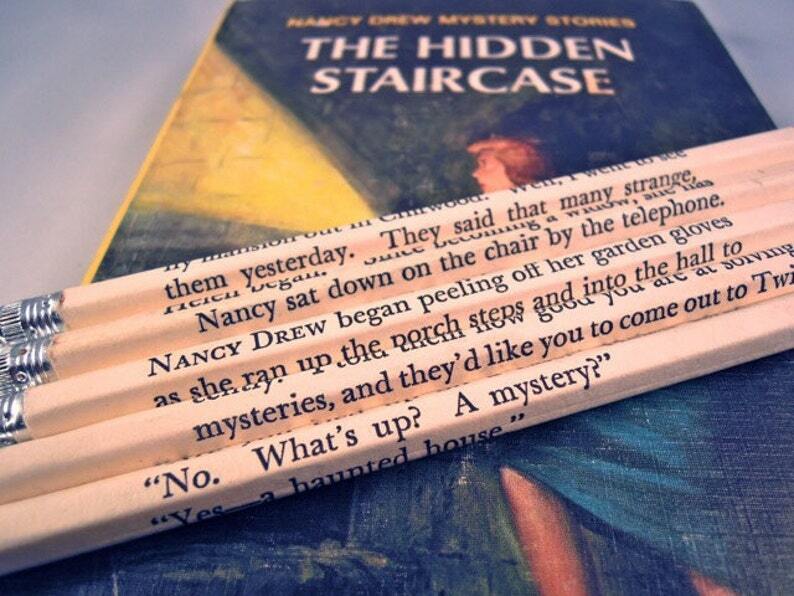 A set of five #2 pencils, wrapped with pages from the classic series, "Nancy Drew and the Hidden Staircase." Each pencil has been hand wrapped by myself, and is standard length and sharpened. Please note that the pencils pictured are not necessarily the pencils that you will receive. These pencils will make great and unique gifts for any lover of this beloved classic! Each set will come packaged in a fabric pencil pouch. This style is also available wrapped around Pens! Just check out that section of my shop for more information! The pencils are even nicer than I thought they would be. They are a great addition to my Nancy Drew collection. The seller shipped them quickly. I am very satisfied with my experience with this shop. Gorgeously wrapped pencils, fast shipping and great packaging! Would definitely buy from again! I accept PayPal, credit cards or gift cards through Etsy's Direct Checkout. I do understand accidents happen during checkout so please inform me within a reasonable time to fix the problem and cancel your order without penalties. Custom Orders: No refunds will be issued once a custom order is placed. All other orders can be returned at any time. Please inform me about why you are returning your items prior to returning your order. Shipping is at the expense of the buyer and purchase price will be refunded once your item is returned to me in its original condition. Any damaged or used items returned to me will not be refunded. Please allow 2-4 business days for crafting and packaging before shipment. All U.S. items are sent out first class mail, under the current shipping price and will arrive within 5-7 days. All orders come with delivery confirmation and tracking. International shipping is possible at regular international rates. I am not liable for any lost or stolen mail. Once your package leaves my care it becomes the responsibility of the United States Postal Service. I will always do my best to help sort out any problems that may arise as I wish this to be a pleasant experience. If you have any questions please do not hesitate to convo me. All my products come from a smoke free home.